They currently have a showroom in the Dallas-Fort Worth Area. The benefit to having someone local is no travel cost, easier to meet, and less chance of something happening to them on the way to your wedding. They have multiple years of experience serving the same type of clients we serve in terms of both traditional Indian weddings and mixed/fusion weddings. It's important to value all cultures irrespective of the number of guests coming from each side. Our couples within the past few years loved working with them. We only wanted to give you the best South Asian wedding decorators in Dallas. We like their work and we enjoy working with them. The following Top 7 Indian Wedding Decorators in Dallas are ranked based on who we have worked most often with in the last few years. Ketan Mistry is the man behind Divine Decor of Dallas. He has secured the first position on our Top 7 Indian wedding decorators in Dallas list. In the last two years, we have worked together the most often. They can do any type of wedding, but their main focus is Gujarati weddings. A vast majority of weddings we have done together are couples with both sides being Gujarati. His second home is SLPS. If you are getting married there, chances are you are going to book him. Take a look at the decor they did for Danny & Nikita's 4 day wedding. We loved being a part of this wedding where we got to witness them descending from the chandelier at the reception (filmed after the same-day edit was made) and we timed our fresh flower canon perfectly to go off as they landed on stage. Don't want to get married at a hotel? Check out our blog on the Top 9 Indian Wedding Venues that aren't hotels. Fill out the form on this page and we will send you each vendors contact information on a single page. Barely missing the number 1 spot by just a few events, is none other than Weddings by Farah. Farah & Fahad Shah are the dynamic duo that make up Weddings by Farah. These two are married and know each other inside out. We have done many weddings together and we love seeing them at events. Their couples are split pretty evenly amongst Hindu (South & North Indian), Christian (Malu) and Muslim (Indian & Pakistani). Check out highlights from Maha & Abdullah's wedding weekend we did together at Omni Dallas in downtown. If you are still looking for a venue check out our blog on the Top 22 Indian Wedding Venues in DFW. Prashe is one of the biggest brand names in the Indian wedding industry. They have a trendy showroom in Dallas and we work together often locally. They also do a lot of great weddings in the surrounding states which has became a big part of their business. When a couple wants ultra contemporary or lavish luxury decor, they are a perfect fit. Prashi & Pramel Shah are a brother-sister team that are known for some of the most elite Indian weddings in the country. When we work together its usually for a luxury Indian wedding or a luxury fusion wedding. Check out this video from Megha and Tejas' wedding weekend where we worked together. If you need a decorator for your Indian Wedding, fill out the form on this page and we will send you everyone's phone number and email address. Nalini Kannan is the woman behind Decor One and is always smiling. She is a great decorator and focuses her efforts on doing good work and doesn't worry about being on social media. We have done many weddings together and recently the weddings have been mostly mixed or fusion couples. Here is a video of Alex and Nina's wedding at Union Station in Dallas. If you need a decorator for your Indian wedding, fill out the form on this page and we will send you everyone's phone number and email address. Cindi & Ashish are the power couple that owns Blissful Celebrations. Along with decorating Indian weddings they also do quite a few American weddings and corporate events. They have the widest reach in terms of types of weddings they currently do. Their breakdown of events are similar to ours. Out of our 250 weddings we do a year; 50 are Non-Indian weddings, 100 are fusion weddings where one side is of South Asian decent and 100 weddings where both sides are of South Asian decent. Check out a video from a wedding we did together for Sarita and Souvik, which was also featured on The Knot. 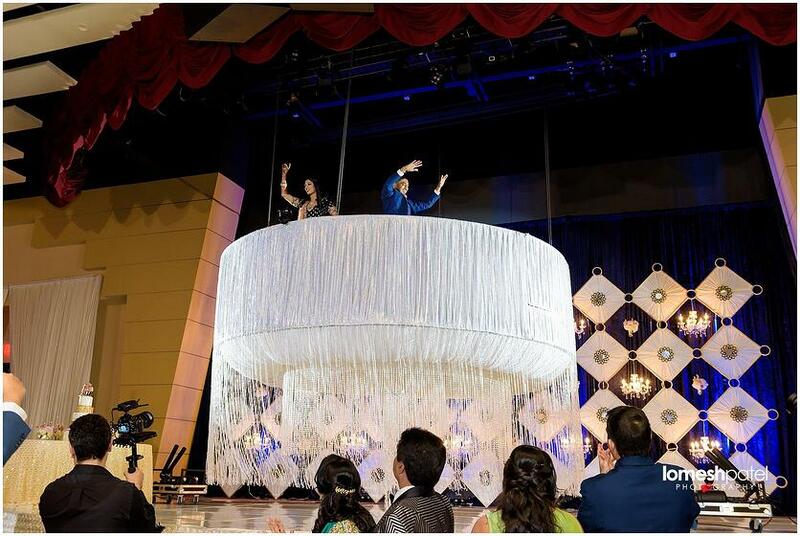 They loved how our amazing production with dancing on a cloud and fresh flower canon looked against the wonderful decor. Find the perfect Indian Wedding Decorator for your wedding in Dallas by filling out the form on this page. Wedding Decor by Faiza is ran by the husband and wife team, Sultan and Faiza. A majority of weddings we have done together are fun Sunni Muslim weddings where people value great music and want to have a good time. Faiza made the Top 7 Indian Wedding Decorators in Dallas list because she finds a way to work with couples expectations and budgets. Here is a wedding we did together for Thoa & Hardik at Southfork Ranch. Find the best Indian Wedding Decorator for your wedding in Dallas by filling out the form on this page. Elegant Affair is ran by Suman and Vasu Pai. This married couple has been decorating weddings longer than anyone else on this list. We have done many weddings together in the past 10+ years, but don't see them as often lately. Their work is always consistent and has been that way for years. The only reason they are at the bottom of the Top 7 Indian Wedding Decorators in Dallas list is because we don't see them as often as we use to. Find the perfect Sourh Asian wedding decorator for your wedding in Dallas by filling out the form on this page. Here is the highlights from Urvi & Sunny's wedding we did together. A wedding is the happiest moment in your life and you should choose an Indian wedding decorator in Dallas that fits your style and taste. If you need a photographer based in Dallas, check out our local favorites. Over our 24 years of bringing joy to thousands of couples, the DJ Riz Entertainment team has performed many times with everyone on the Top 7 Indian Wedding Decorators in Dallas list. Given these points, if you would like to talk about which South Asian wedding decorator you should select or for more information on our services contact us here.